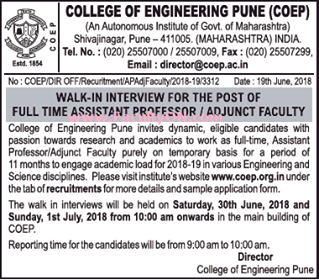 College of Engineering, Pune has advertised in THE TIMES OF INDIA newspaper for the recruitment of Assistant Professor / Adjunct Faculty jobs vacancies. Interested and eligible job aspirants are requested to appear walk in on30th June and 1st July 2018. Check out further more details below. About College: College of Engineering, Pune (CoEP), chartered in 1854 is a nationally respected leader in technical education. The institute is distinguished by its commitment to finding solutions to the great predicaments of the day through advanced technology. The institute has a rich history and dedication to the pursuit of excellence. CoEP offers a unique learning experience across a spectrum of academic and social experiences. With a firm footing in truth and humanity, the institute gives you an understanding of both technical developments and the ethics that go with it. The curriculum is designed to enhance your academic experience through opportunities like internships, study abroad programmes and research facilities. PhD in appropriate discipline with minimum First class or 6.75 CGPA on a 10 point scale both at UG and PG. Candidates with post-doctoral fellowship, good academic record, relevant experience shall be given preference. The major discipline and the relevant / appropriate disciplines are as notified in the AICTE notification F.No.27/RIFD/Pay/01/2017-18 dated 28th April 2017 and will be made applicable to posts advertised by the institute. How to Apply: The candidates have to fill ONLINE application form available on Institute website. Softcopy of the filled in application form alongwith scanned copies of the documents related to qualifications, professional experience and achievements are required to be send by email to faculty2018@coep.ac.in. The last date for the receipt of the ONLINE application form through email is 27th June 2018 till 5:00 p.m.